Officials with the Redwood National and State Parks in Humboldt County say a suspect has been arrested for vandalizing old-growth coast redwoods in the park. In March, concern over the poaching of burls — knobby growths, usually at the base of redwoods — led the parks to close a scenic road that gives ready access to the giant trees. Burls are highly prized by furniture makers and collectors because of their unusual grain structure. Park officials reported today that a yearlong investigation led to the arrest of a man in Orick, a town about 30 miles north of Eureka and near the center of the park. They identified the suspect as Danny E. Garcia, who's charged with vandalism, grand theft and receiving stolen property. He's scheduled to be arraigned Wednesday. A second, unnamed suspect is reportedly already in custody for a separate offense. On April 19, 2013, a researcher in the park discovered cuts on an old growth redwood tree within Redwood National and State Parks (RNSP) in the Redwood Creek drainage. 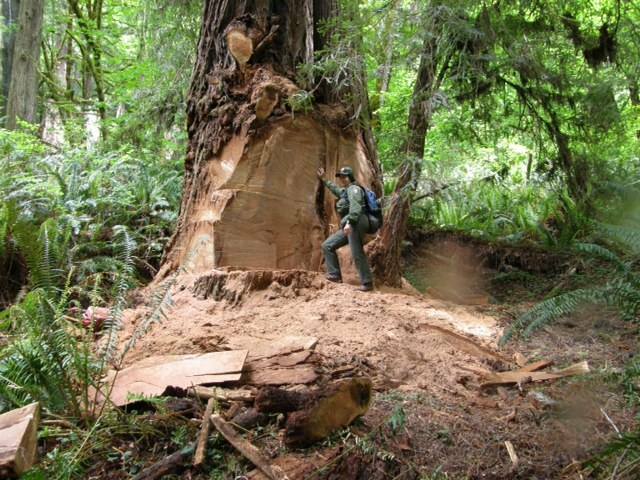 Park rangers responded and discovered a 10-foot diameter, old-growth redwood tree that had been badly damaged by the removal of several large burls. The burls cut from the tree were massive, the largest cut measuring approximately 8.3 feet at the base, 8.2 feet in height, and 1.7 feet deep (approximately 115 cubic feet). Park officials say rangers are in the middle of several investigations in Humboldt and Del Norte counties related to theft and damage to coast redwood. The parks' law enforcement tip line is: 707-465-7353. Bomke said today that in addition to the tip line, the parks are working on setting up a reward fund. He added that the enforcement effort currently underway is the strongest he's seen to fight a crime that's been going on for decades. "While this has been going on for many years, 30-plus years, it seems that the intensity, frequency and brazenness was increasing dramatically," Bomke said.